Dr. Martin Luther King Jr, came to Cleveland often. His first visit was on August 7, 1956 to deliver a report on the progress of the Montgomery bus boycott speaking at the Hollenden House. Throughout the sixties he continued to visit the city, speaking at Antioch Baptist Church, St. Paul’s Episcopal Church and Cory United Methodist Church to name a few. After wining his Nobel Peace Prize, Dr. King was honored at the Cleveland Sheraton Hotel at a fundraiser for the Southern Christian Leadership Conference. Following a number of incidents of violence in Cleveland, he made several school appearances encouraging students to “learn not burn”. 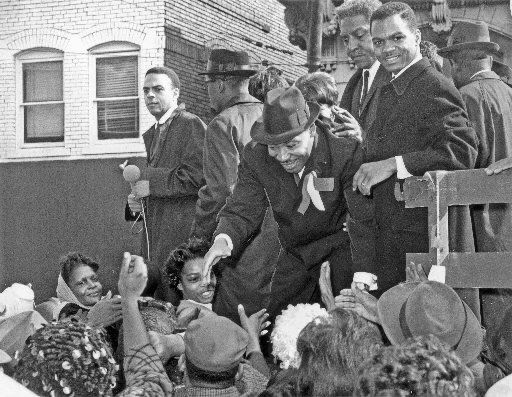 In 1967 he came to Cleveland to urge people to register to vote and vote for Carl Stokes, the first African American to become mayor of a major US City. Dr. King was assassinated on April 4, 1968, just six days before he next scheduled visit to Cleveland. Today on MLK Day, we honor his life and legacy.